Today I took the herculean task of updating all the posts in the separate pages tabs of my blog. It was then I realized that I had not posted the review of this book here. I had posted it on the bookreview blog and had some how missed posting here. This is the first book I read this year and it was simply soul stirring! So, if you had missed this post, here it is again. 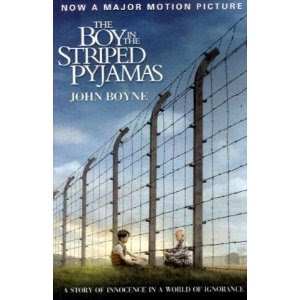 The Boy in the Striped Pyjamas by the Irish Novelist, John Boyne is a very moving and heart rendering story of a nine year old boy 'Bruno'. The story is set in 1942 during the period of World War II. Bruno lives in Berlin with his parents and sister, Gretel. His father is a high ranking officer in Army. One day, Bruno returns home only to find that things were being packed as they were moving to some other place. Bruno feels devastated by this news and shows his displeasure to his parents to no avail. He fears the thought of leaving his three best friends for life and a lovely 5 storeyed house in Berlin for some unknown countryside. Bruno hates the place from the time he arrives there. He hates the place as he has no friend to play with and the new house is not as grand as his house in Berlin. He does not get along with his sister too well as she always tries to show off that she is older than him. Bruno has a very inquisitive and curious nature. After some time of his arrival, he notices people far away surrounded by a high wire fence from his bedroom window. The strange thing he finds is that all of them are wearing the same types of stripped clothes. He ventures asking her sister who asks him to stay away from them. His father forbids him seeing at their direction telling that they are not even real people. Miserable with his loneliness and curiosity, he decides to explore the place he sees everyday from his window at the back of the house. One day, when no one is around he sets out for his expedition and walk though the trees till he gets to the high fence which he could see from his bedroom's window. He spots a boy on the other side of the fence and is glad that at last he will have a new friend here. He strikes up a conversation with the boy whose name is Shmuel to find that they are in Poland now! Also, he finds out that they are of the same age and share the same birth date. Bruno visits him daily and sometimes he would smuggle some left over food from his house for him. Gradually, their friendship grew. Although, the boys were of the same age, they were from a very different background, different upbringing and at the moment in very different situations. What happens to them and their friendship is the thing to read in the novel. I am sure you will be moved by it. Despite all that the story seems like a fable. Whats makes the story fable like is the fact that even at the time of World War II, a curious son of a high ranking officer be so ignorant and unaware of the things happening around. How can he not know the appalling torture and atrocities inflicted to people (Jews) by his country men. The story leads him from ignorance to revelation only to be subsumed by it.
" And then the room went very dark and somehow, despite the chaos that followed, Bruno found himself that he was still holding Shmuel's hand in his own and nothing in the world would have persuaded him to let it go." I have seen the movie and found it heart rending..I would like to overlook the fact that the boy was unaware of the actual atrocities due to his innocence and his age..Nice review..